Its Simple! No-coding, no setup and no buttons – OneTouch SelectSimple has an icon-driven interface with no coding, no setup or no buttons. Just insert the strip to start, apply blood, and results can be obtained in a matter of seconds. High-low colour and audio alerts - With colour and audio alerts, you are alerted when blood glucose levels are extremely high, high or low. 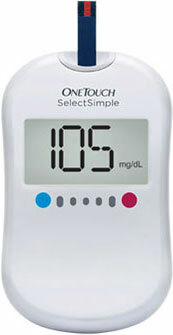 To Recieve updates and possible rewards for OneTouch Select Simple Glucometer please sign in. To Recieve updates and possible rewards for Glucometer please sign in.